The preparations… the vows… the flowers… the first dance… the secret smiles and quiet moments… the laughter… the memories. That’s why it’s important to hire Denise & Paul for your wedding video. We are Chicago's First Choice in Wedding Videography. We believe it’s our cinematic vision that helps us capture every beautiful moment and the very essence of your special day. Our professional wedding video services will provide beautiful memories for yourself, family and friends. You can count on our unobtrusive documentary style filming and movie like editing. This package is designed for couples who would like filming of their wedding service only. The Lavender Wedding Video is edited documentary style package has all the components essential to remembering your special day with single camera coverage of your ceremony and reception. The Orchid Wedding Video package is for brides that want to film all the beautiful moments of their special day with multiple cameras for the ceremony and single camera reception coverage. The Rose Wedding Video will complete your day with a custom edited video with your style preferences. This is a full featured two camera cinematically edited film with a highlight reel of your wedding day.
" After my sister got married 6 years ago, I KNEW I wanted to have 1st Wedding Videography for my wedding. They watch their video every year on their anniversary & we plan to do the same! " " The Wedding Video was better than we imagined. Marcus initially didn't want to spend the money but after seeing the video he was sure glad we did. Capturing Marcus with his grandpa, who then had passed away a few days after the wedding. Our families have also really enjoyed our wedding video. " " We got to watch the video on Thanksgiving day. It was totally awesome. You did a wonderful job and I would highly recommend you to anyone. My favorite part? Believe it or not I loved when Jen turned around and smiled and Tim did also just before their vows and ring exchange. Also, I LOVED the ending 'credits' amazing. The whole thing was great! I actually enjoyed the video more than I did my wedding day... I got to see it. " Begin your dinner with a masterfully produced video and photo montage created from pictures that you've selected and we edit and set to music of your choice. Wow your guests while they see why you're getting married to your fiancée with this declaration of love and admiration for each other. 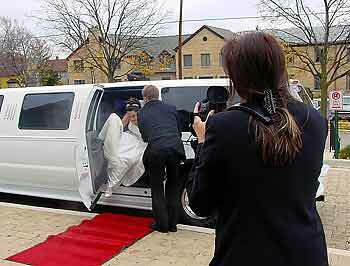 To learn more or to get pricing call (847) 843-1089 to speak with a Wedding Video consultant.